Nerdly Pleasures: Will the Real Successor to the Pitfall Legacy on the NES Stand Up? 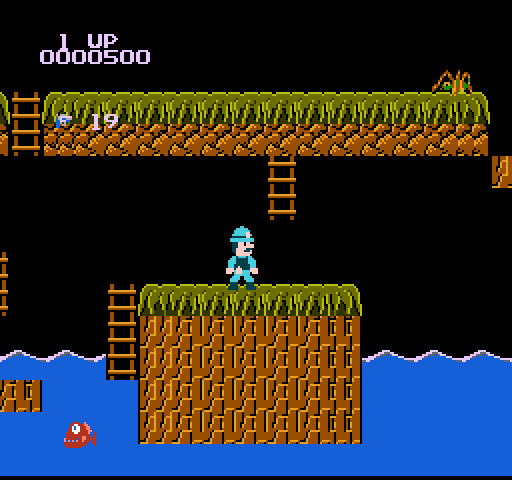 Will the Real Successor to the Pitfall Legacy on the NES Stand Up? 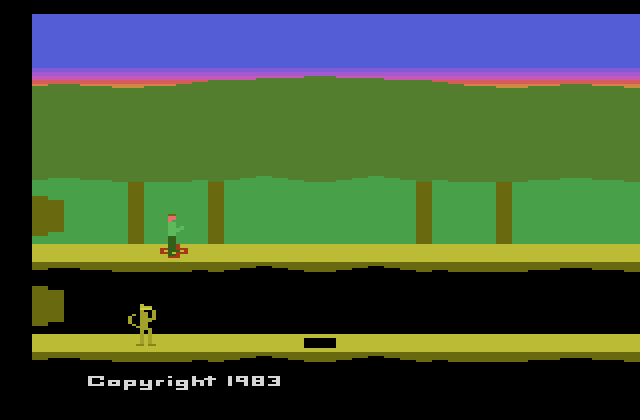 There never was a game called Pitfall III. 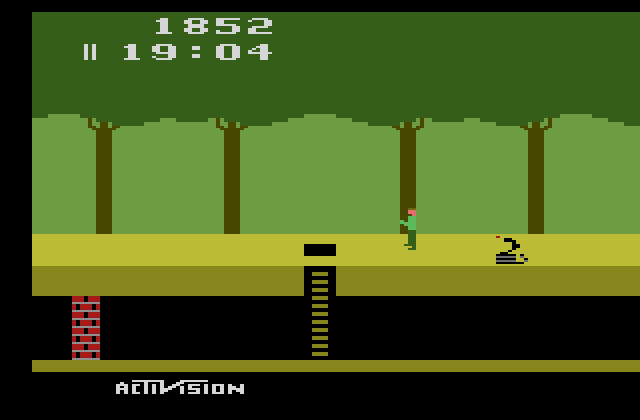 David Crane programmed the original Pitfall for the Atari 2600 in 1982 while working for Activision, a company he co-founded. 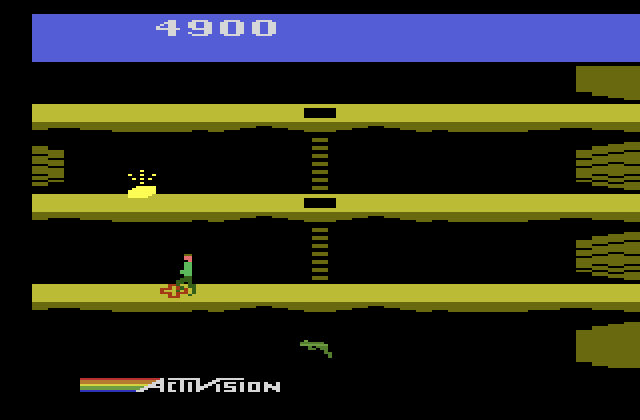 Two years later he released Pitfall II: Lost Caverns for the Atari 2600. Thereafter came the great Video Game Crash and Crane left Activision in 1986 to co-found Absolute Entertainment. 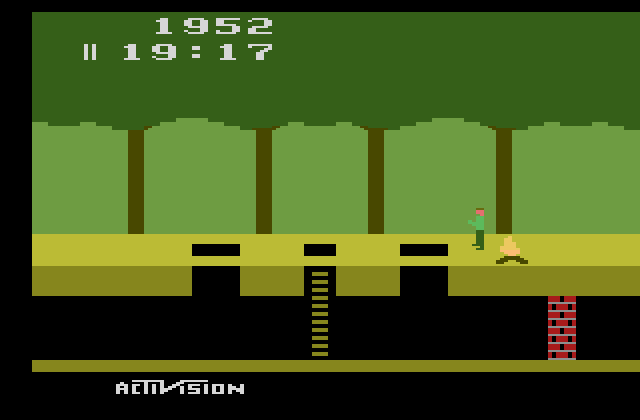 While there would be other games in the Pitfall series, this blog entry will discuss three games released or were to be released during the third generation of home video game consoles would could compete for the right to be called the successor to the Pitfall Legacy. Pitfall essentially made David Crane as close to a household name as video games got before the Crash and cemented his reputation as a game designer worthy to be inducted into The Academy of Interactive Arts & Sciences' Hall of Fame. This game was a massive success in its day, selling over four million copies and ported over to all the major consoles and many of the popular home computing platforms of the day. 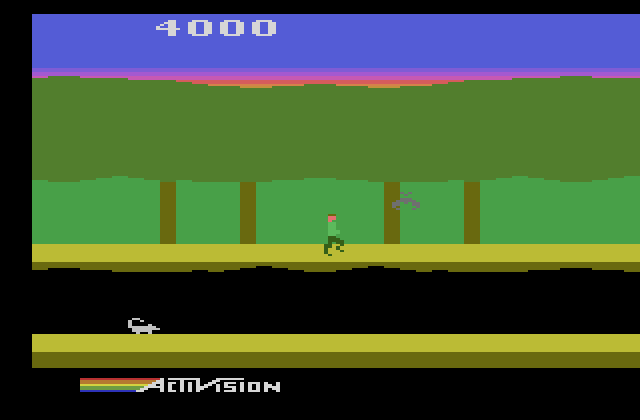 Pitfall is one of the first platforming and side-scrolling games, even though the Atari 2600 hardware did not accommodate scrolling and this game only used static screens. This game was inspired by Raiders of the Lost Ark and invited players to explore a large, non-randomized world. 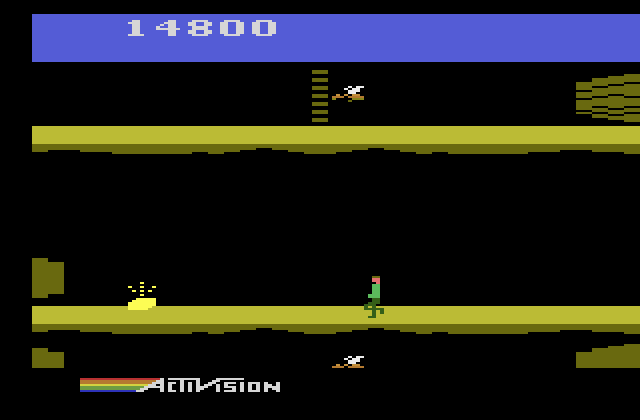 In fact, Pitfall is actually far more popular than the official 2600 Raiders adaptation because Crane was able to pare the exploration concept to the basics while still maintaining a sense of fun. You can just pick up and play Pitfall, Raiders requires reading the manual and a lot of trial and error in order to make any sense out of it. 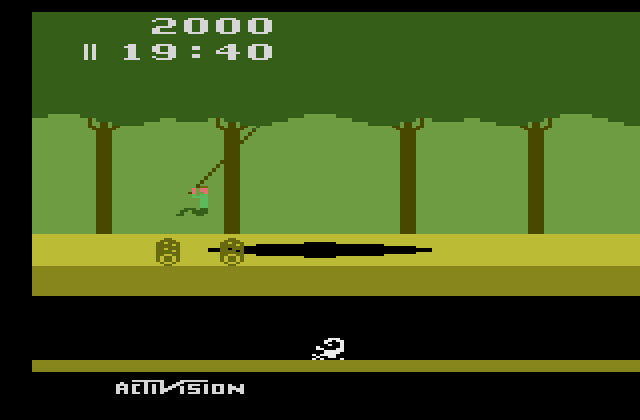 There are many dangers in Pitfall : tar pits, lakes (both of which can expand and retract from what appears to be solid ground), crocodiles, scorpions, snakes and campfires that can kill your character, Pitfall Harry. Logs can steal points if you collide with them, vines can allow you to cross over dangers, you can jump on the crocodile's heads to get over water, ladders and holes allow you to go underground and the underground passages allow you to "warp" a few screens, if there is no brick wall in the way to block you. 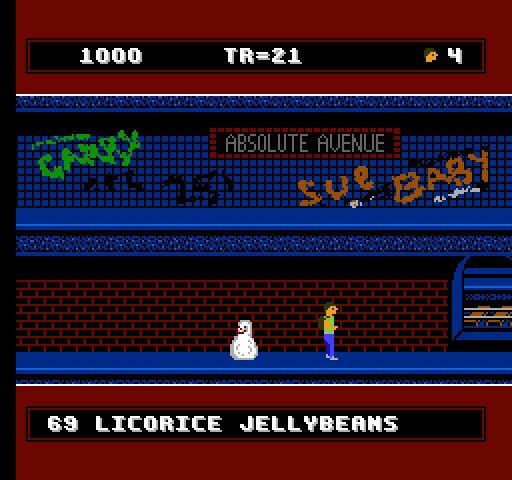 Multi-colored "sprites", a relatively detailed background and catchy sound effects and jingles make the game a visual and aural treat for the 2600. Finally, there is plenty of challenge in that you have to locate 20 treasures strewn across 256 screens in 20 minutes with 3 lives. You will need to map and plan carefully and identify useful warp passages if you want a good chance of finishing the game. Important to note that unlike most other Atari 2600 games this game will end (it just stops) if you find the twentieth treasure. One other important theme to note here is that Pitfall Harry has no way to kill any of the enemies which he encounters. In Pitfall, you have to jump over or otherwise avoid all obstacles, including animals. This aspect will be maintained in the other games Crane designed and discussed in this article. Ultimately finding non-violent solutions is a recurrent theme throughout almost all the games Crane has designed. Two years after Pitfall, Crane released his sequel, Pitfall II: Lost Caverns. He did not reinvent the wheel or take the series into a radical new direction. 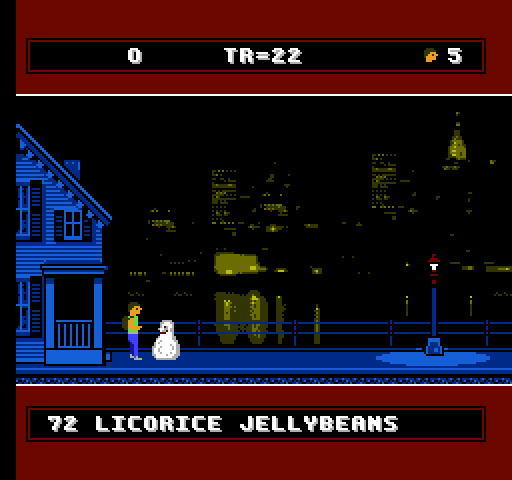 Some sprites and mechanics were taken from the previous game and the two games are visually similar. However, he expanded the concept by taking the basic exploration theme of the original game (which only used the horizontal plane) and expanded it into the vertical plane. There are eight horizontal screens and twenty-seven vertical depth levels which you can explore. In other words instead of having 255 screens stacked together horizontally, you have a grid of 8x~8 screens, adding an extra dimension to the world. Now Pitfall Harry can swim in water and has checkpoints to start at if he is "killed". You do not die in this game, you just get sent back to the last checkpoint. Nor is there a time limit. There are several new enemies, like electric eels, frogs, vultures, bats, the rat and the return of the scorpions. The vultures and bats travel in a repeating pattern across the screen. In addition, each time you enter the screen they may start from a different position than the previous time you entered the screen. This makes it hard judge when you can run underneath them, but you have to run past them to make progress in many areas. At one point you will need to catch a balloon to progress further in the game. You can find typical gold brick treasures for points, but the object of the game is to find your pet Quickclaw, your girlfriend Rhonda and a diamond ring. The game ends when you obtain all three with Harry doing some victory jumps before the game stops. You loose points by colliding with enemies or falling and landing after a certain height. The screen scrolls vertically as you descend and explore the "lost caverns". 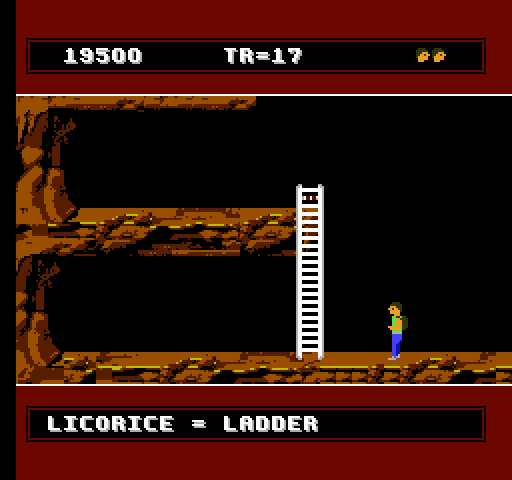 The look of the game is still very much in line with Pitfall, and like Pitfall, the only thing you can do is climb and descend ladders, walk left and right or jump. Crane designed a special hardware chip for the cartridge called the DPC. Because of this chip, Pitfall II was undoubtedly the most complex cartridge ever to be released on the Atari 2600 during its lifetime. The DPC chip allows bankswitching up to 10KB of ROM (Atari carts are only 2K or 4K without bankswitching; Pitfall is a 4K game), a hardware random number generator, hardware to assist with graphics processing and hardware to generate the data to feed into the internal 2600 audio to create three additional channels of sound. 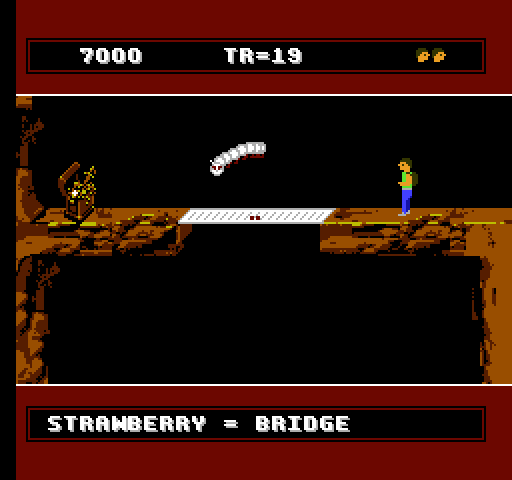 There was not enough space to put the Adventurer's Edition second quest into the 2600 original that was present in the Atari 5200, 8-bit and Commodore 64 versions of the game. Thanks to the DPC chip, Pitfall 2 has music playing throughout. There are four pieces of music, the treasure theme, the return to checkpoint theme, the default theme and the balloon theme. This music plays according to what happens during the game. 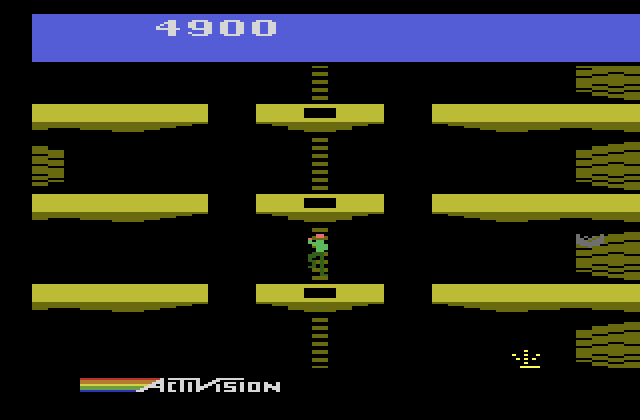 Multi-channel music as heard in Pitfall 2 is difficult to pull off on the 2600, but when coupled with an advanced game engine like Pitfall 2's, it needed hardware assistance. The 2600 was too long in the tooth when David Crane was developing A Boy and his Blob, the 7800 and the Sega Master System did not have the market share and the Commodore 64 was dying in the US. 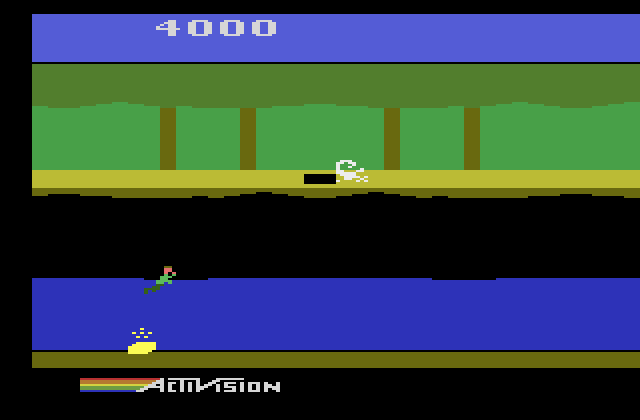 Having left Activision, he had no more right to create a Pitfall sequel than I would. 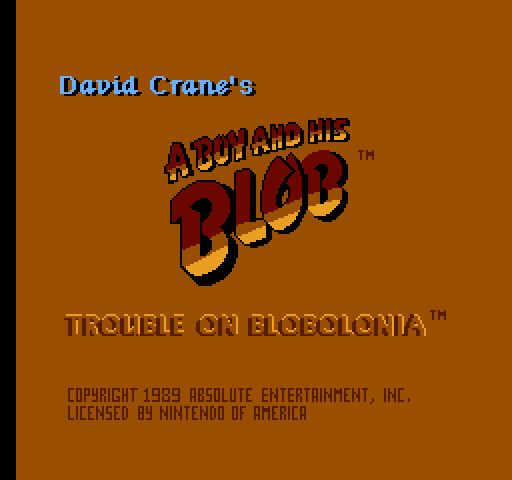 He ended up creating A Boy and his Blob for the dominant platform of the day, the NES. A Boy and His Blob to me feels like Pitfall III and in addition to having its creator at the helm, let me explain the design similarities between this game and its Pitfall predecessors. 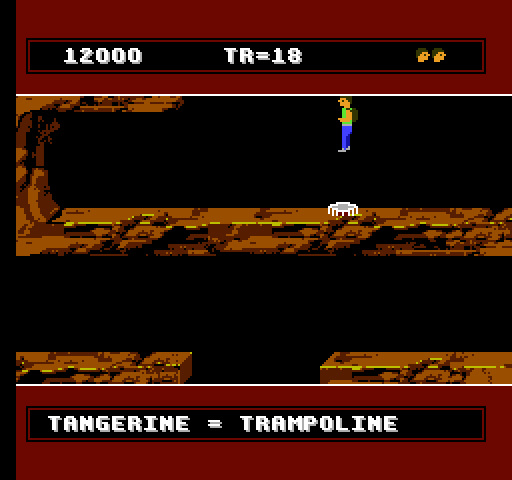 The Boy in the title is less capable than Pitfall Harry, he can only move/run left and right, he cannot jump unaided. However, he has a companion, the Blob, which functions as a puzzle solving device. Using different flavored jelly beans, the Blob can do different things. Need a ladder, feed him the licorice jelly bean. Want to drop down to the next level, turn the Blob into a hole with the punch jelly bean (you can do this multiple times for one bean). While you have 15 flavors to choose from, your supply of jelly beans is limited and you need to use them wisely. 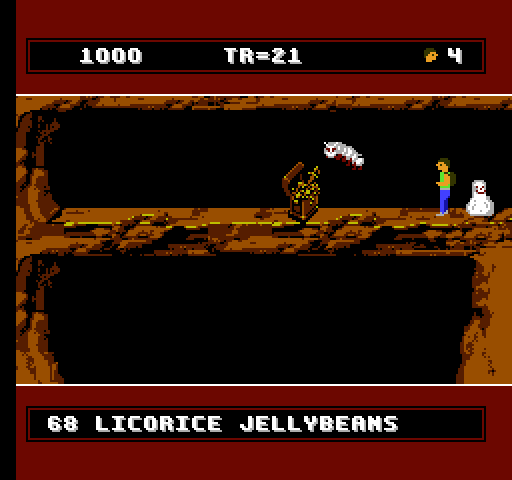 The Blob and jelly bean mechanic represents an evolution over using the character's own abilities to get past obstacles. Like Pitfall 2, this game requires exploration of caverns beneath the surface. Similarly, the game is structured in a grid of non-scrolling horizontal screens. 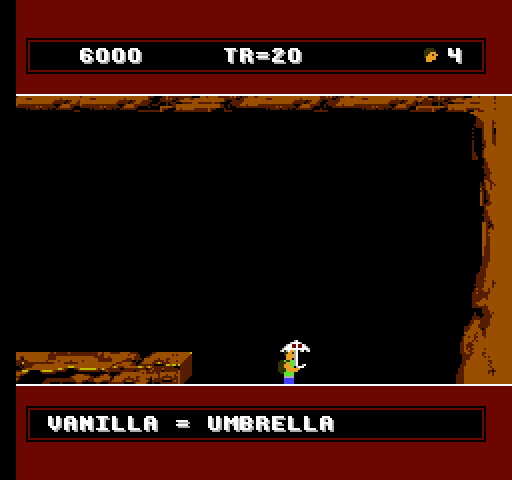 Unlike Pitfall 2, the screens do not scroll vertically, despite the superior NES hardware. I do not believe this was done because David Crane could not figure out NES scrolling but because the levels were so vast and less structured than Pitfall 2 that it would have made map making much more difficult. The caverns have many dangers, including subway serpents, falling rocks, spider webs and stalactites and stalagmites in the water. However, unlike Pitfall 2, the omnipresent danger is death by falling. If you fall more than one and a half screens (without a device that can ease your fall), you die. You start off with five lives in this game and no continues. Also, your Boy moves a lot looser than Pitfall Harry, so you may run into something you cannot avoid and cannot turn back quickly enough to lose a life. You cannot swim but the Blob can help you with that. Finally, if you lose a life you will start at the point where you found your last treasure similar to Pitfall 2's checkpoints. 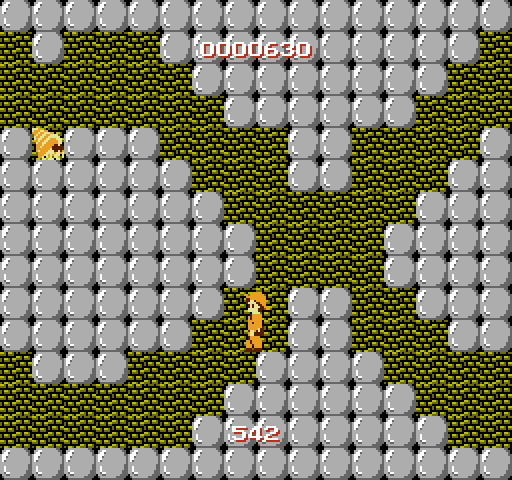 The goal of the first half of the game is to find treasures and escape the caverns. 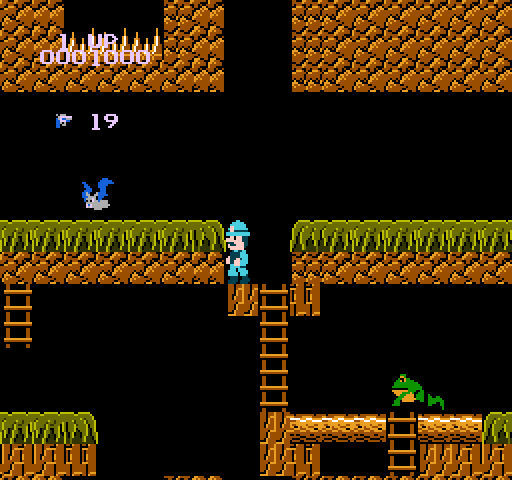 There are 22 treasures located in different areas of the underground caverns, similar to Pitfall 2. At the bottom of the caverns you will find an underground lake just like in Pitfall 2. These treasures allow you to buy vitamins that you will need on the Blob's home planet, Blobolonia. 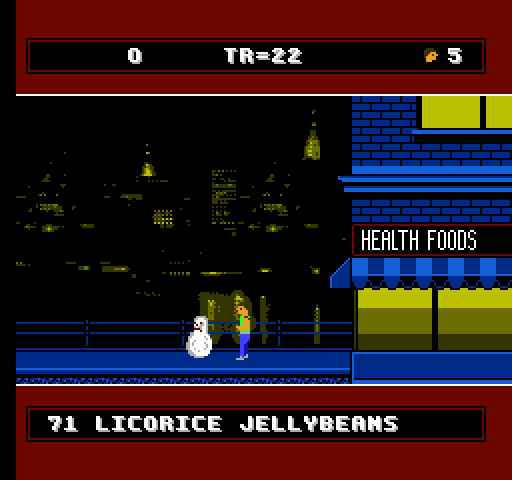 The second half of the game is a shorter experience where you have to dodge more enemies and defeat the evil, sweets-loving emperor. Ultimately, gameplay is the key focus of this game. The graphics are drab and backgrounds are mostly black underneath the subway. It is quite easy to get lost because screens often look alike. 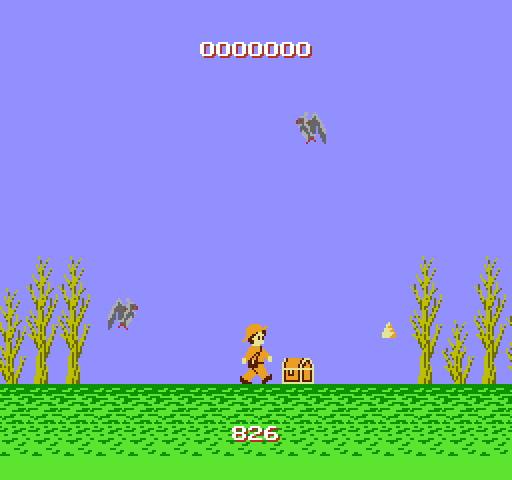 Music is limited to one basic piece of music for the game (in addition to the title screen music) and a few sound effects and ditties that play at certain times. I am aware that there is a game for the NES called Super Pitfall, but that is an abomination that David Crane had nothing to do with. 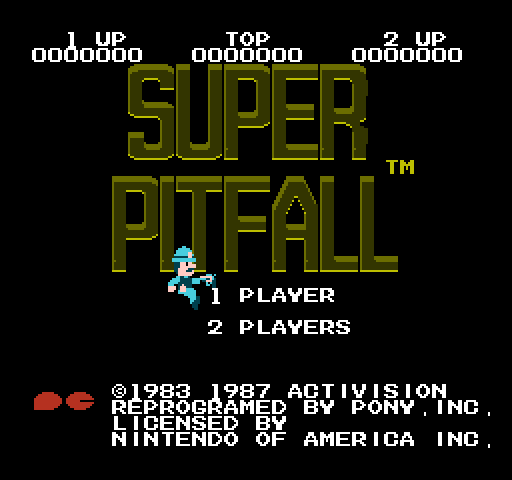 It is a port of a Japanese PC-8801 game by Pony Canon where is was called Super Pit Fall. Post-founders-era Activision licensed the title and published it as one of its first NES games. Activision may hold the rights to the Pitfall brand, but that does not mean it earns a place here considering its pedigree. 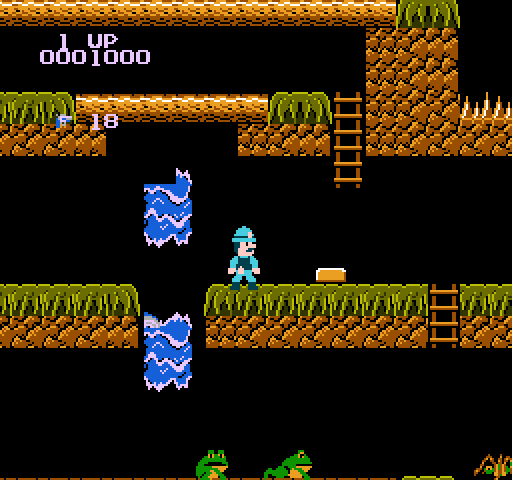 Super Pitfall is a stripped down port from programmers who did not quite get the NES. Scrolling is choppy, graphics are barely NES-worthy, the music is a 15-second piece intended to give you an idea of what hell feels like and there is quite a pause as the level loads. You can now duck and shoot a gun with limited ammo and there are a couple of bosses, which pretty much sums up the evolution of this game over Pitfall 2. Hit detection is unfair. Even the manual states that the gun will feel useless at times, which is refreshingly honest. You can see glitches with sprites not infrequently. 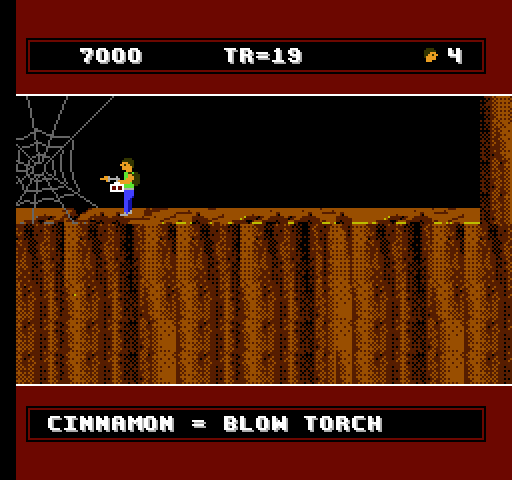 The gun mechanic does introduce an element foreign to Crane's Pitfall games. Also, items are invisible, so you have to jump in certain places to make them appear. The game is filled with cheap deaths, in fact if you go down the first ladder in the game you will almost certainly die. Like Pitfall 2, you have to obtain the diamond, the pet and the girlfriend to win the game, but there are more obstacles to overcome. The world is huge (270+ screens) but you only have three lives and no continues, so it will be difficult to get a feel for it. 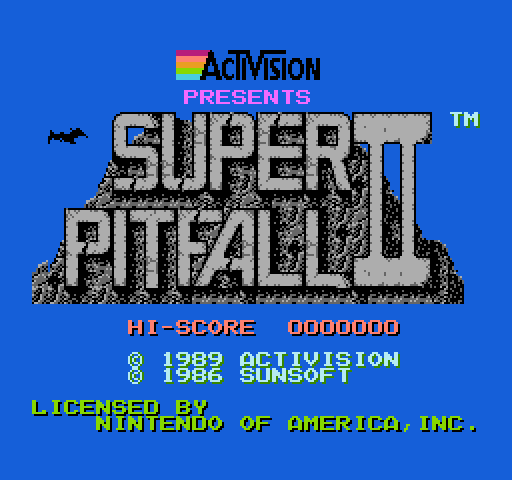 There was going to be a game called Super Pitfall 2 released for the NES, but was canceled. There is a prototype ROM floating about. Super Pitfall 2 was a port of another Japanese game, this one a Famicom game called Atlantis no Nazo (Mystery of Atlantis) by Sunsoft. 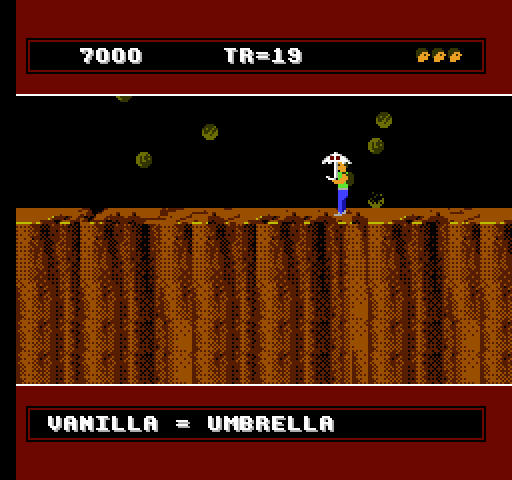 The prototype appears to differ from the Japanese original only in its title screen. Unlike Super Pitfall, Super Pitfall 2 is competently programmed. Sunsoft was willing to hire competent programmers, Pony not so much. The graphics are still bland but the music is pretty decent and the control is not quite as frustrating. Your weapon is a bomb that you can throw, but it detonates when it wants to and can kill you if you are in its (short) blast radius. The jumping could use more polish (you cannot change your trajectory in mid jump like Castlevania) and the game will get frustrating very quickly. The bats dropping guano as a weapon is a nice touch. The shell crabs will hide in their shells if they perceive a bomb coming, so killing them is a bit tricky. Still, the violent solution is out of place in Crane's Pitfall games. 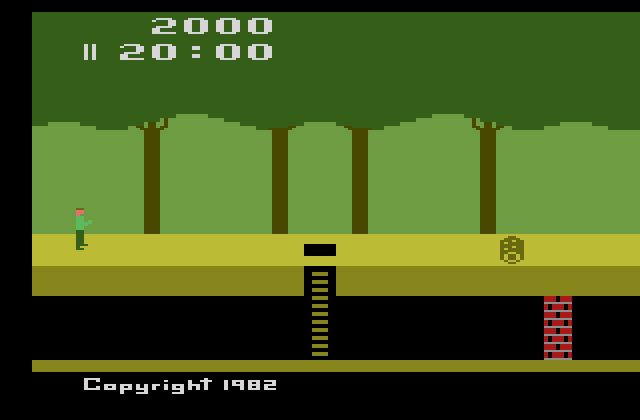 Ultimately, Super Pitfall 2 is really a horizontal side scroller. The level progression is fairly linear and it does not feel like a Pitfall game at all. You can find doors that will take you to a small portion of a later zone, but the game is still linear. 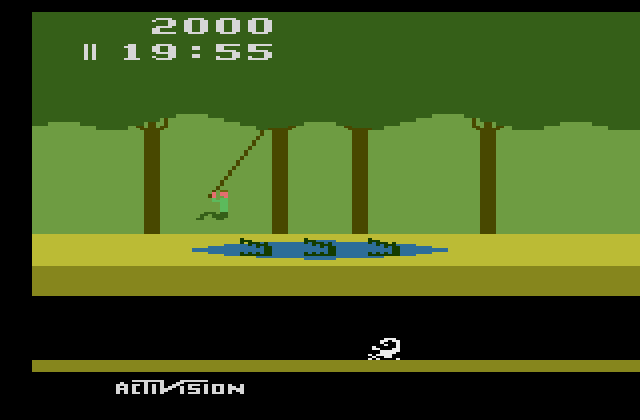 Even Super Pitfall was better at conveying an open world. Pitfall's influence on the game is still present. The enemies appear to be mostly of the natural variety and there are treasure chests you can open for points. Between its lack of a real Pitfall feel and its rather long-in-the-tooth status for 1989 when Activision was considering porting it, it is no surprise that it eventually went unreleased. 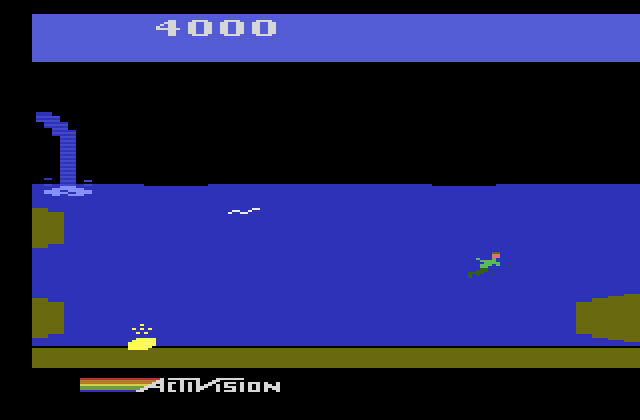 An optimist may wish to believe that Activision saw that its former founder had released a Pitfall-like game in the same year and did not want to compete with him, but my idea is probably the more likely reason.